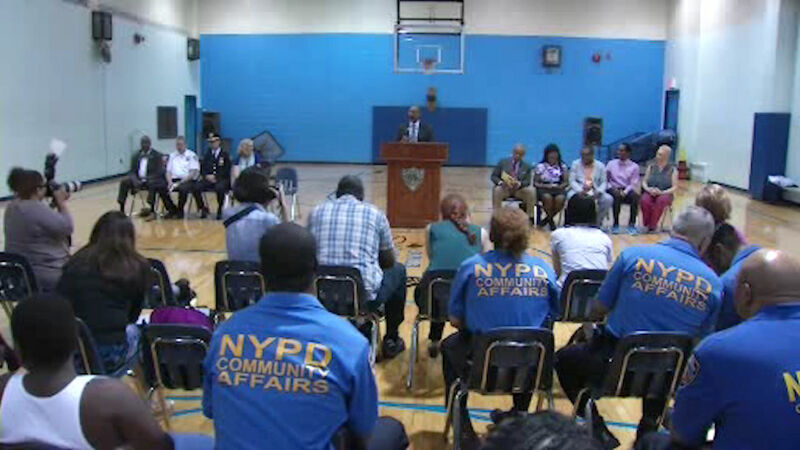 HARLEM (WABC) -- A ribbon-cutting ceremony was held Tuesday for a Harlem gymnasium that was renovated through seized narcotics proceeds. The Frederick E. Samuel Community Center at a Housing Authority development on Lenox Avenue now has a refurbished gym featuring a new scoreboard and refinished floors. Funding for the project came from drug trafficking proceeds obtained during criminal prosecutions by the Office of the Special Narcotics Prosecutor. The Special Narcotics Prosecutor's Office and the NYPD's 32nd Precinct began an investigation into drug sales in the vicinity of the housing development in July of 2015 in response to community complaints of drug dealing and violence in the area, authorities say. During the investigation, defendants made about 50 sales of crack cocaine to undercover NYPD officers, involving approximately four to 10 individual "zips" of crack cocaine each. A total of 10 defendants were arrested in February of 2016, five of whom shared one cell phone to make sales, according to prosecutors. Four defendants were sentenced to varying amounts of jail time and four are awaiting sentencing. "Using seized drug money, we are thrilled to deliver this renovated gym back to the community we serve-with the help of the Police Athletic League and the Special Narcotics Prosecutor," said Police Commissioner William J. Bratton. "It is my hope this facility can help us in continuing to build meaningful relationships with the residents of Harlem, both on and off the court." "This new gymnasium is a powerful example of how collaboration between NYCHA and law enforcement is making neighborhoods safer and more connected," said NYCHA VP for Public Safety Gerald Nelson. "With this major investment, ill-gotten gains have been repurposed for the good of the community." The ceremony was followed by a community basketball game.